There were a number of poets at the festival, and it was wonderful to hear them talk about their work and especially to hear them read their own poems. Hearing any author read his/her work adds a depth and dimension that you just can’t replicate when you read it to yourself from the page, but I think this is especially true of poetry. Maybe because poetry is (in part) a kind of music–as much an auditory experience of rhythm and sound as it is idea and meaning. Below are some nuggets from three different poets. 1. He continually revises poems, even after they’re published. Poems have two lives–they participate in a market economy and then there’s the level where they’re between him and God. He does find that sometimes after he revises a published poem numerous additional times that the published version is actually the best version of it. 2. He comes to the page each day and asks if there’s any word from the Lord, and then he writes and writes, but often, it’s just his own words. He doesn’t want to be a writer/poet so much as he wants to make contact with the divine. When he’s revising the poem, he’s also revising himself. 3. Safety is of great concern to him. The poems he heard in high school were beautiful but ‘unsafe.’ Christ’s voice in the New Testament is safe. Blake’s voice in his poetry is safe. Lee also wants to be a safe person. When asked to define more clearly what he meant by ‘safe,’ he replied that safe poets are fully realized or wise; they bless what needs to be blessed and kill what needs to be killed. Poets he put in this category are Adrienne Rich (“her later poems”), Philip Levine (“early poems”), Louise Bogan, Rilke, and Lorca. Also loves John Logan (Catholic poet), Blake, and Dickinson. 5. Commenting on his experience as an immigrant: being a stranger is a powerful place to be–you can see things others can’t; you ask questions others don’t think to ask. 1. Part of what we do as writers is preserve things–writing has a ‘fixing’ effect. Our country is becoming increasingly homogenized. He loves meeting and talking to the ‘old-timers’ in Kentucky (his home) because they talk in a way that’s different and unique to their particular region. That’s disappearing. 3. He admires William Blake and feels that if you’re going to follow an impulse, you have to acknowledge its opposite. I attended a talk Susanna gave about using fictive elements in poetry, so most of these notes are related to that topic. 1. the social contract between poet and reader isn’t as clear as it is with prose, which has fiction and non-fiction categories. In poetry, it’s not always clear when the content is about the author, whether the speaker is the poet, etc. 2. she likes to write a kind of hybrid of persona and personally fictive. She will draw from friends’ experiences/stories as well as her own, and she will change details to fit whatever she’s trying to get across in the poem. 5. It is the process and the place it takes us into–the threshold/sympathy. When we can get there with other people’s experiences, it makes us wider and takes us out of ourselves. 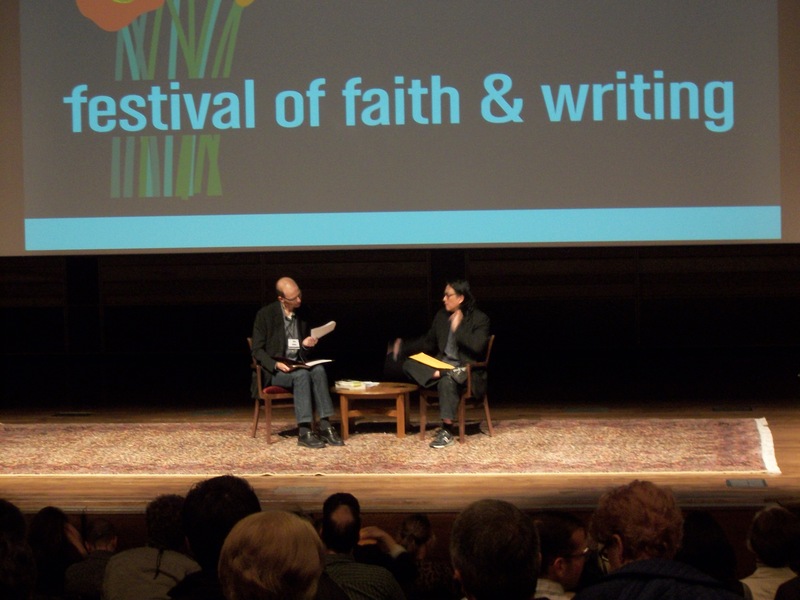 As I mentioned in an earlier post, I had the opportunity recently to attend the Festival of Faith and Writing at Calvin College in Michigan. It was three very intense and jam-packed days of listening to lots of different authors and poets talking about lots of different topics and reading their work. I came home with a small notebook full of scribbled notes and a suitcase heavy with books. Partly to give myself a chance to process some of what I experienced and heard, and partly because so many friends have asked about the festival, I’ve decided to post some ‘excerpts’ over the course of the coming week or two. 1. In regards to what he decides to write about, he said that you have concerns in life that tumble around in you like clothes in a dryer, and at some point they’re ready to take out. 2. In regards to the style of his work and the sometimes competing elements of the text (ex: a letter in Extremely Loud and Incredibly Close that’s marked all over with red circles): We’re living increasingly dissonant and fragmented lives, which should be reflected in art. At the same time, literature is still very traditional–unified, chronological, etc. Literature is compelled to be more traditional than visual art (needs to be liked by a large number of people vs. a painting liked and purchased by one very wealthy collector). He likes that about literature because it’s more democratic, which keeps it more grounded. 3. Art takes things that are not valuable in one context and makes them valuable in another. When you shape your story into something more than just your story, it takes on another kind of value (how you put it together). 4. In regards to becoming a writer, he was very inspired by sculptor Joseph Cornell. He loved the feeling of the effect Cornell’s art had on him and wanted to create that effect himself. He went from appreciation to trying to make something out of that appreciation. Becoming a writer meant moving into becoming a participant. He did not really ever think about being a writer until he one of his professors (Joyce Carol Oats) referred to “your writing” and he realized he actually had his own writing. Her naming it helped make it more real to him. 5. A lot of his writing has come out of not being able to communicate something in life. He writes to fill the holes. The older he gets, the more he believes that there is nothing we shouldn’t be able to write or talk about. Silence is not good. Quiet is good, but not silence. If you don’t create, it’s like the dryer door is broken and you never get to take its contents out and see them. 6. When asked about the series of final images in Extremely Loud, he said he likes seeing/imagining things go backwards. It makes the mundane fascinating–weird and beautiful. He likes things that make him be/feel in the present moment; things that surprise and delight him. If there’s a way to re-envision something ordinary so that it’s beautiful or revealed, that’s amazing. 7. With regards to religion, he’s interested in a religion that makes things harder, not easier. He’s not interested in it for comfort but for pushing him to question who he is and to ask hard questions. 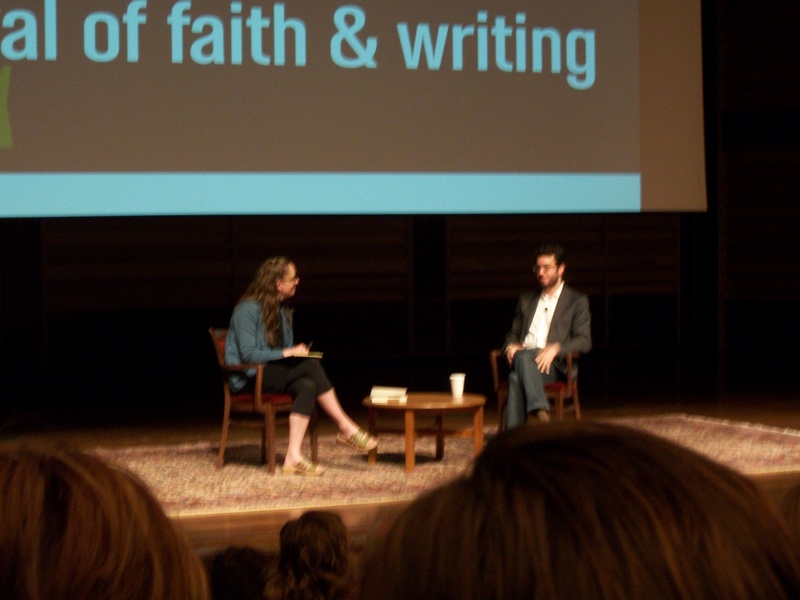 He believes in the value of stories in the Old Testament (esp. Abraham and Isaac) but feels the question of whether they literally happened is irrelevant. 8. When religion is used so that we can have things both ways, that bothers him. He likes when it narrows things and provides a framework. When asked about prayer, he quoted Heschel–“I don’t pray for the things I want. I pray to be worthy of the things I have.” He believes in that kind of prayer–one that articulates who you are. 9. When asked if he believes in God, he responded that he couldn’t really answer that. “What do you mean by God?” If you can put God into words, that’s not really God. Doesn’t have a clear answer, but he finds wrestling with and thinking about this very fulfilling. 10. Regarding his editing of the New American Haggadah (‘guidebook’ for Passover), he said that the tradition is that you are supposed to be part of the story. You are the one being liberated, which he sees as similar to the demands of the novel–the reader needs to feel complicit in the story. 11. Novels give room to the reader and require work. Through their reading/imagination, the book takes on their own experience and meaning. He gave the example of saying the word ‘tree’ and how everyone in the room would picture a different tree, each with its own reason/meaning. Reading is personalized vs. a movie that you just receive. Also mentioned Kafka as an influence (in addition to Joyce Carol Oats, Amichai, Cornell). Here’s me doing my best not to completely geek out while he’s signing my book (I was barely coherent when he greeted me). 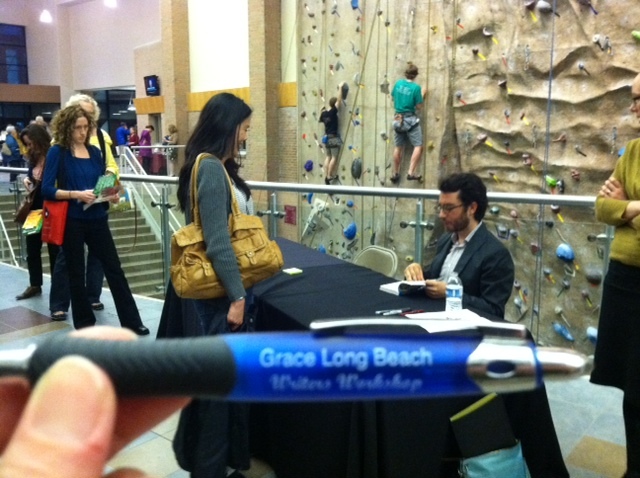 The pen is a nod to the writer’s group I’m part of at church. We’re so excited we have our own pens that we’re trying to take pictures of it in as many locations as possible.